Synonyms: Kinnikuman: New York Close Call! Crisis in New York! 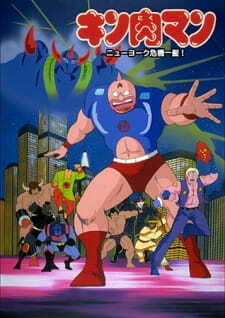 is the sixth theatrical film based on the anime series Kinnikuman. It was released in Japan on March 15, 1986 alongside Captain Tsubasa: Race Towards Tomorrow, GeGeGe no Kitarou: The Great Youkai War, and Choushinsei Flashman. It is set after the Dream Choujin Tag Arc. This was the last film to feature a cameo from series creators Yudetamago. It was also the second and last film to feature the Announcer. The villain in the film is Akuma Shogun, who appeared in the original manga and anime series as the leader of the Devil Knights during the Golden Mask Arc. Seiyuu Hidekatsu Shibata returns as the main antagonist of this film, having previously played that role in Great Riot! Seigi Choujin.